EAC/Marine was born to automation and M2M (machine to machine) applications. This EAC Box PCs are essentially embedded fanless PCs configured for a various application of processing and input/output control task. It combines different processor with extensive and Flexible I/O support both for connection requiring RS232/422/485 serial ports with isolation and auto-direction function as well as digital I/O Ports, standard USB connections and Gigabit Ethernet. Good thermal engineering means no fan and therefore no ventilation holes. 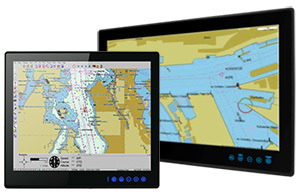 The elegantly designed, yet rugged, industrial grade maritime panel PC and Display series is designed for usability with brilliant true-flat screens, which offer superior readability and Projected capacitive touch (P-CAP) technology, available in 19", 24", and 26" options. This series also offers international special certifications (DNV 2.4, IACS-E 10, IEC 60945 4th Edition), which enables the safe operations on yacht.